A few weeks back I wrote a story with the headline that the Apple App Store has the money but that Google Play owns the future. Not everyone agreed, but the latest annual app report from App Annie begs to differ. 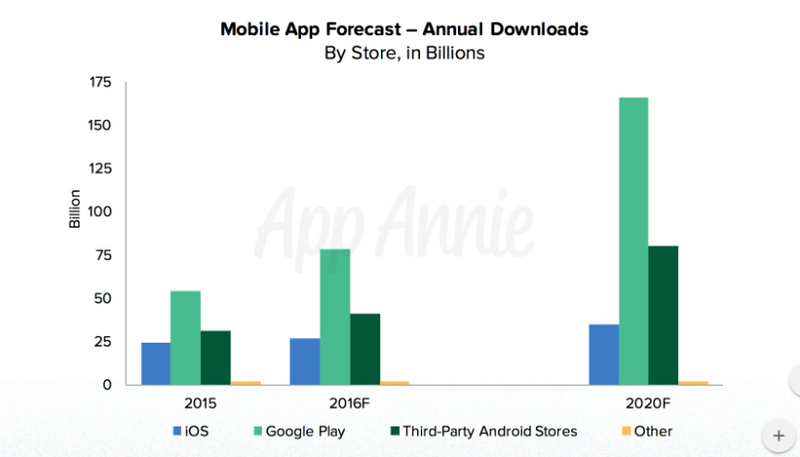 App Annie projects massive growth in the app market to 2020, with Play Store growth four times stronger than App Store growth. Not only that, Google Play downloads are expected to triple by 2020, when the global app market is expected to break the $100 billion barrier. Google Play downloads are expected to triple by 2020, when the global app market is expected to break the $100 billion barrier. The report is very clear about the increasing importance of mobile apps in the future, stating that “all companies need to view themselves as app publishers irrespective of their mobile strategy,” noting that apps have become the primary way we engage with media, brands and each other. The report claims “usage is the new currency,” with app usage increasing by an astronomical 63% just between 2014 and 2015. This increase in engagement will be accompanied by an increase in downloads as well as in revenue, but for very different reasons. Global app store downloads are expected to hit 284 billion by 2020, more than doubling 2015’s figures. This explosion of app growth will be facilitated by the mobile install base increasing from 2.6 billion in 2015 to 6.2 billion in 2020. As always, much of this growth will be, thanks to emerging markets. Global app store downloads are expected to hit 284 billion by 2020, more than doubling 2015's figures. App Annie earmarks Mexico, Brazil, Turkey, Indonesia, China and especially India as the markets to watch, forecasting a huge upswing in not only app installs but also app revenue in the years to come. As expected, the divide will largely follow the familiar format: Android will get the installs but Apple will get the money. This is because in the context of the research, where emerging markets tend toward lower-cost Android devices and Apple loyalty kicks in at the other end, Apple’s ecosystem is seen as being mature while Android is still in the rapid growth phase. The report defines a growth market as one characterized by a huge numbers of downloads but with relatively low engagement and revenue. This exploration phase is typically seen at the start of a user’s (or market’s) contact with a platform. Lots of downloading and trying things out, but without established app habits or “active user” status. As a market or platform matures though, users develop their stable of go-to apps and begin to use them more, downloading fewer new apps but increasingly spending more money to unlock premium features or subscriptions in the apps they favor most. But the established situation where Apple rakes in all the money and Android gives away free apps is not set to last forever. In fact, iOS is only expected to lead in app revenue until next year, when the combined revenue of Google Play and other alternative Android app stores will surpass it. Sure enough, Google Play’s progression means it will eventually surpass the App Store on its own, but that date lies outside the scope of the report. If Android follows the same trajectory as Apple on the path to maturity, as its much higher number of users start spending more, Google Play truly will own the future. But even within currently mature markets like the U.S., Japan and South Korea, download growth may be starting to wane but app revenue is still increasing. Again, it comes down to increased usage rates, facilitated by better and more intuitive app interfaces and experiences. App Annie cites Tinder’s simple swipe gesture as an an example and notes that the incredible array of sensors on mobile devices increasingly afford app developers the opportunity to learn more about usage habits, user needs and the best ways to make their apps more engaging. But eventually even revenue will plateau in mature markets, because users will have not only already discovered their core set of must-have apps, but will also be much more likely to have already paid for premium features or upgrades. Even the mobile install base will slow down, as most new sales will come from replacements, with only a small increase in the lower-end segment for new device activations. However, this saturation point will coincide with explosive growth in mobile commerce and advertising revenue and growing contributions from new areas like wearables, IoT, VR, AR, auto and TVs. How often do you install new apps? How much do you spend on apps each month?